Wednesday 10 January 2018, the first day of lessons for the new class of Boulangerie Diploma students takes place. The beginning of 2018 sees two new classes, both made up of 15 students, starting at the school. Boulangerie is a profession which involves the senses. Each 6 hour class combines a demonstration by the Chef and a practical. Today, we are working on the fermentation of baguette and croissant dough. For the first 2 months of their training programme (basic level), students learn manual kneading but also how to make baguettes, viennoisieries, special breads and decorative elements. This is followed by another 2 months (advanced level) to round off the training programme and includes making leaven, and natural fermentation. Students make products using raw materials and learn to master other fundamental textures. “For the final Diploma exam, I ask students to make a personal creation: this has resulted in some very pleasant surprises” shares Chef Boudot. A 2-month compulsory internship completes the training programme. 40% of students are taken on by the company in which they carried out their internship when it comes to an end. The remainder take a variety of paths: international careers, joining a boulangerie team in a hotel (e.g. : Merve Armagan, Plaza Athenée) or even opening a boulangerie. Classes are taught by the 3 boulangerie Chef Instructors: Chef Boudot, Chef Somoza and Chef Hoel. 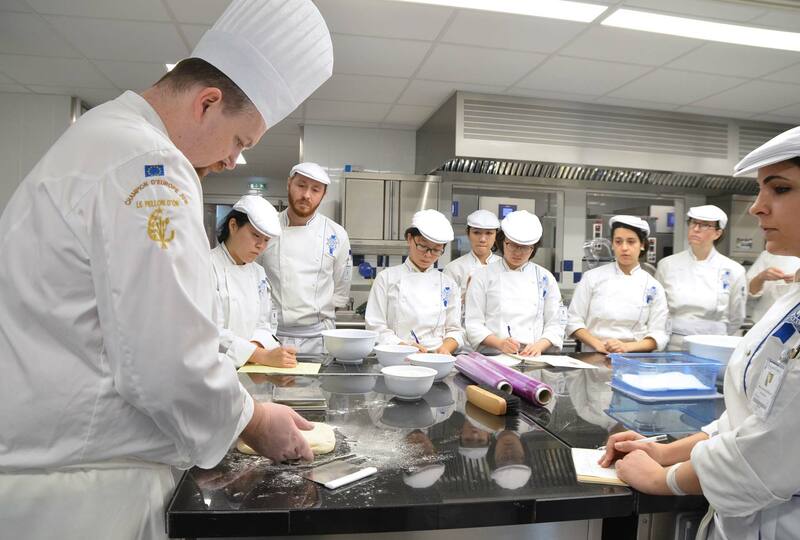 In addition, students visit mills, boulangeries and benefit from training days with guest chefs such as chef Felez. There is also the opportunity to take part in boulangerie workshops, make bread and freshly baked pastries for Le Café at the school, and play a role in events such as Europain.